You’ve Got bitcoin, Now What? So you’ve created a wallet. You set up an account at an exchange, or a service such as CoinBase.com, or you even to met someone in person via localbitcoins.com. Last but not least you actually bought some bitcoins! Congratulations! Now what? Sit on the bitcoins in the hope that they will escalate in value and we can all become gazillionaires. If I see another prediction that each bitcoin will be worth 10 or 100,000 dollars I’m going to pull the few remaining hairs out of my head. No one has a clue what bitcoins will be worth in the future. However it is a fact that many if not most bitcoins in existence are simply sitting in addresses and have never been spent. Speculating on their potential increase in value is perfectly reasonable. Of course they could just as easily fall in value, thus the term “speculation”. Rather then simply sitting on your coin, one fascinating thing you can do is to loan your bitcoin via a number of peer 2 peer lending services. Since bitcoin exists within a totally decentralized infrastructure, you don’t have to get anyones permission to loan bitcoin to someone else. There are a number of peer 2 peer lending services. In particular I’d suggest checking out BTCjam.com. You look at requests for loans, the interest rate they will pay you and the time period for the loan. Pay attention to the detail of the people requesting loans and the suggestions from the site on how to reduce your risk. Overall it’s a very cool way to try to earn money from your bitcoins and help some folks out at the same time. You can sell your bitcoin, via a service such as localbitcoins.com and try to make some profit by selling for more then you paid. Of course feel free to sell for less but that usually won’t last too long. Last but not least, you can buy stuff! Yes you can actually buy good and services. The biggest “store” that accepts bitcoin directly is Overstock.com. 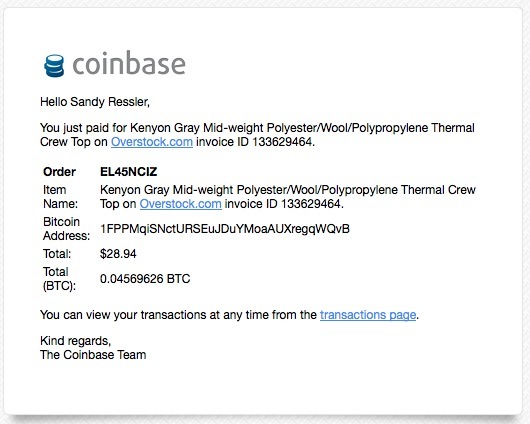 It’s great fun and just cool to go to Overstock and click on paying with bitcoin. The transactions are as fast as using a credit card, you get a confirmation, just like using a credit card and everything is smooth. I can’t say that as a consumer there is any great benefit to using bitcoin versus a credit card, but if you like the idea of denying that extra little fee to a big bad bank (and doesn’t that put a smile on your face) then bitcoin it. Another cool way of buying lots of different things is via the “Gyft” service. Gyft is a company that let’s you buy other companies gift cards. However you can pay for your Gyft card via bitcoin! So if you want a giftcard from CVS, or Zappos or Sephora you can simply put money into your Gyft account and even better use an app on your phone to buy products with the supported gift cards. And you can pay for it all with bitcoin. Very snazzy! There are more and more places that accept bitcoin. Naturally there are web sites that keep track of this such as SpendBitcoins. Now you have no excuse to not buy bitcoin and do things with it, so go forth and consume. Well I’ve been “into” bitcoin for nearly a year and like most people I’ve simply been hoarding my coin. It’s time to start spending! I recently had the opportunity to register for Bitcoin2014 (come join me! http://bitcoin2014.com/) in Amsterdam and naturally since the option of paying via bitcoin was available I had to try it. I had never actually bought anything with bitcoin before so I was in virgin territory. The process was surprisingly simple, straightforward and painless, partially due to good web design and partially due to luck. The bitcoin portion was run handled by bitpay and when I clicked to pay a “bitcoin:” URL was created and executed by starting up my wallet (a Multibit wallet) that happened to be on the computer I was using to register. Multibit asked for my wallet password (very reassuring) the payment was made and all was right with the world. No long delay it all worked fine. A day or two later I decided to purchase a “Verso Card” (https://versocards.com) which is a cool hardware gadget about the size of a credit card that you can use as a cold storage wallet but with the convenience of an online wallet because you link it to an app on your phone. (I haven’t received it yet so can’t tell you if it works well or not.) Anyway I went through the usual purchase process and at the end it printed a bitcoin address and said please pay first before clicking button. So I had to manually go into my wallet put in the address and then wait for like 10-15 minutes for the transaction to be confirmed until I hit the button on the Verso card page. This is totally unreasonable for normal purchases. If I had hit the button the page said they would not mail the card, so I was warned but this is not a “ready for prime time” way of conducting business. 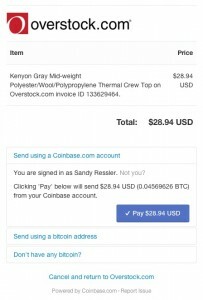 I don’t know what the difference is between the bitpay managed purchase which happened instantly, and the Verso card purchase, both of which used my same bitcoin wallet. So that part will remain a mystery until I investigate some more. 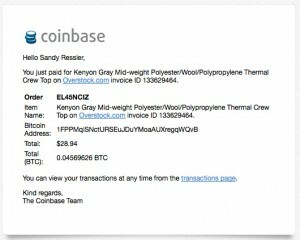 Last but not least, I’ve been reading about Overstock.com accepting bitcoin. I had never purchased anything from Overstock but I headed over to give it a whirl. I created an account in like 30 seconds…surfed to buy some piece of clothing. Place it into my shopping cart. 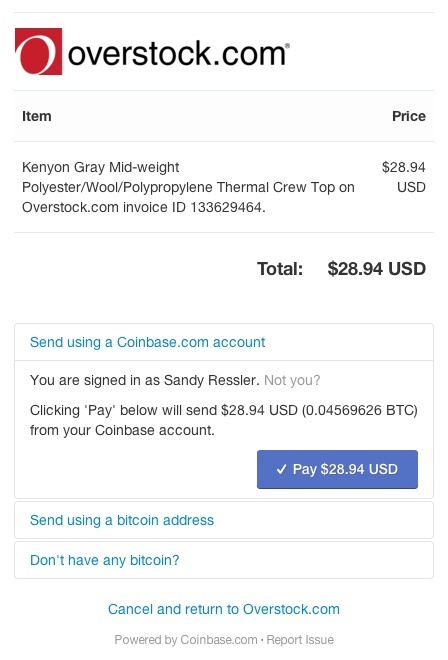 Clicked the pay with bitcoin button, and the transaction was very smoothly handeled by coinbase (which I had previously setup to handle the bitcoin URL transactions, rather then use my wallet). The system asked for my 2 factor Coinbase authentication (also reassuring). I authenticated, and it was all done fast! Back to Overstock with a “Your Order Was Successful” message! Hey you know what the bitcoin thing might have legs. I also received a confirmation from Coinbase that was also reassuring. All in all, it was an interesting set of spending experiences. I have no doubt the growing pains of using bitcoins for real purchases will be smoothed out and is in fact rapidly getting smoothed out. Just keep your eyes open for some bumps in the road but start shopping! What Bitcoin Topics are You Interested in Learning About? I just realized that rather then simply make up lots of topics for writing I should ask my vast audience (all 5-6) what you would like to see. What kind of topics, related to Bitcoin, are you interested in learning about? I always say the customer’s needs come first! So please make a comment here or feel free to twitter me (it that a phrase at @btcplainenglish.